CSIRO is increasing Vietnam’s capacity to develop regional-scale climate projections and decision makers’ understanding of the impacts of climate change for appropriate planning and investment for adaptation. 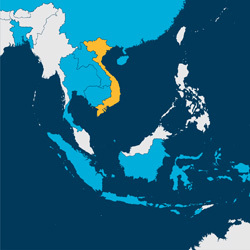 Vietnam is considered one of the countries most vulnerable to the impacts of climate change due to its long narrow coastline, two large deltas and increasing frequency of extreme events (UNEP, 2009). The government of Vietnam is faced with the challenge of planning and prioritising its climate change response in the face of significant uncertainty around the extent of climate change impacts. The Vietnamese Ministry of Natural Resources and Environment (MoNRE) is building on the national climate change scenarios and undertaking more detailed downscaled projections to better understand climate change effects at the provincial and community level. All provinces are required to develop or change action plans under the National Target Program to Respond to Climate Change. Localised projections will help provincial governments to determine their priorities for adaptation based on their particular vulnerabilities. This project aimed to improve Vietnam’s understanding of the impacts of climate change, integrate past and current research for a more complete assessment of the potential effects of climate change, and provide information necessary for appropriate planning and investment. The project also developed innovative communication tools to ensure that the data generated is widely accessible. Generation of a dataset of high-resolution dynamically downscaled climate projections, as well as updated sea-level rise projections, for Vietnam. Analysis of these new ensemble projections, as well as observed datasets and previous projections, increased knowledge of the drivers of climate change and helped to capture the range of uncertainty in future climate, aiding assessment of risk. Analysis of the projected changes of means, both annually and seasonally as well as extremes. In addition, projected changes in key climate phenomena affecting Vietnam, such as droughts, monsoon, heat waves and tropical cyclones were are analysed. A climate futures tool and website were produced to provide guidance for the effective use of, and increased access to, the projections. It is expected that the Institute of Meteorology, Hydrology and Environment (IMHEN) will incorporate the project outputs in their 2015 adaptation planning. Participatory planning and strengthening the skills and capacities of local researchers and government agencies also facilitated the social networks in Vietnam, allowing IMHEN to gain confidence in downscaling and increase its knowledge and reputation. During this process complex scientific information was translated into useable knowledge for decision makers, donors and local planners. New partners emerged to take the research forward. The original targeted stakeholder was the Vietnamese government and their 2015 National adaptation planning; however, as the project progressed outputs were increasingly requested from NGOs and other donors in the region, such as Red Cross and CARE for their future planning, and the Asian Development Bank for assessing their Ho Chi Minh City road development project. Skills in climate modelling are highly specialised and require a long-term commitment to training, technical exchanges and professional development. Participatory teamwork and collaboration worked on this complex problem. Specifically, the collaboration between IMHEN and the Hanoi University of Science (HUS) is ongoing, with benefits to both organisations. Regular team communication (Skype) was very successful in facilitating this collaboration. Climate modelling demands substantial computing power. Sufficient upfront time is needed to complete the modelling before other activities can be completed. Flexibility is needed to respond to demand from unexpected agencies, and to meet their needs for information and skills. The website could have been designed for a more diverse audience, including civil society groups, with targeted training for these groups. The Climate Futures Tool and the dissemination workshops were successful in translating complex scientific data to information that is accessible to and can be applied by non-technical audiences. A climate futures tool and website were produced, providing useable knowledge for decision makers, donors and local planners. Participatory planning and collaboration strengthened the skills and capacities of local researchers and government agencies. New partners emerged to take the research forward. The original targeted stakeholder was the Vietnamese government and their 2015 National adaptation planning, however as the project progressed outputs were increasingly requested from NGOs and other donors in the region.